Whether you’re shopping for your dad, brother, boyfriend, fiance, husband, partner, or just a friend, these techy gifts are sure to make any guy happy! 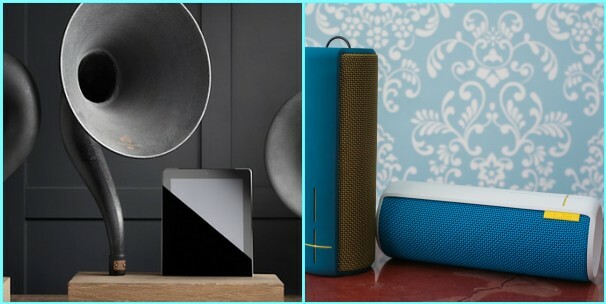 ABCey has gathered 10 of our favorite tech gifts for guys ranging from speakers to chargers. We even want some of these! 1. Beats by Dre designed by Alexander Wang | This very limited edition takes three of these devices and coats them in matte black with pale gold accents, making them truly stand out. 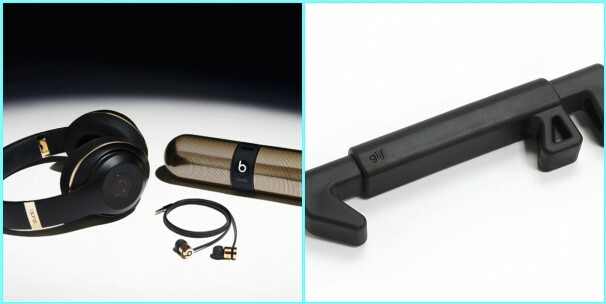 They include the Beats Pill portable speakers, Ur Beats ear buds, and Beats Studio headphones, and each comes in an Alexander Wang embossed glossy stingray case with a zipper and clip. Each one is available in limited amounts in a pre-sale event, but won’t be for long. 2. Glif | This simple device can mount to any standard tripod, letting you get the most out of that little camera you bring everywhere. Better still, it adjusts to fit any phone thanks to the included hex key, so it can prop up your phone at various angles to maximize your viewing pleasure. Being made from recyclable rubberized plastic is just an added bonus. 3. Limited Edition Sondek LP12 Turntable | To mark their 40th anniversary, Linn teamed up with Highland Park, makers of fine single malt scotch whiskey for this exclusive, and amazing product. Linn took their highest performance turntables and encased them in a remarkable whisky wood plinth, made from the actual solid oak casks that matured Highland Park whisky. If that sounds exclusive, it is, and there are only 40 of these that were made. 4. Blue Microphones Nessie USB Mic | For the guy that films everything, help him capture the moment with Nessie. Nessie takes the fear out of great recording by instantly delivering studio-enhanced sound for desktop recording of vocals, instruments, voiceovers and more. 5. 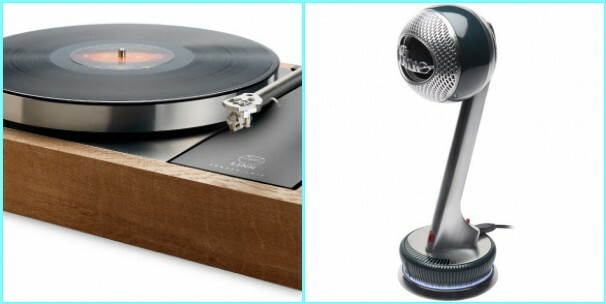 Gramophone for iPhone & iPad | Simply set your device in the handcrafted, solid wood base, and the built-in iron and brass horn will amplify its volume by three to four times, all while looking amazing. A terrific blend of old and new. 6. Ultimare Ears BOOM Wireless Bluetooth Speaker | Unlike other speakers, this one projects sound 360 degrees, filling any space with immersive audio. At a weight of just above one pound, and just over a half-foot long, these speakers are also made to go anywhere, easily slipping into most bags. It’s coated in an acoustic skin that makes it resistant to water and stains. 7. Firestone Fireye Mini Headphone Amp | By sitting in between your device’s headphone jack and the headphones themselves, providing a healthy signal boost without adding much in the way of noise. Just charge it up via USB and you’ll be ready to rock out for up to 24 hours before your next charge. 9. Structure Sensor | This little device comes with a bracket made to fit on the back of your iPad, right on top of the built-in camera. Using the sensor and your iPad, you can measure the three-dimensional space in any room, automatically capture three-dimensional models of everyday objects, and even simulate physics on top of the real world. 10. 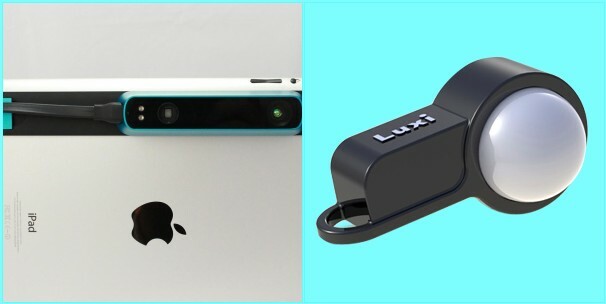 Luxi | Luxi is a small diffusion dome that fits securely over your iPhone’s front-facing camera. When attached and used with a light meter app, Luxi will help you determine the best settings for your DSLR or other camera so that you can take perfectly exposed pictures. Make sure to order your favorites fast, before they sell out! Which one’s will you buy for your special guy?! Let us know in the comments below or on Facebook or Twitter! Tech Tuesday highlights some of the best and brightest ideas in the tech world. ABCey would like to recognize these up and coming companies for their innovative ideas and ability to think outside the box! Being an event planner, we’ve attended conferences and presentations of all kinds. Some of the least memorable include lots of talking, little visuals and minimal audience engagement. Well, there’s a groundbreaking technology that utilizes an Interactive Wall that is changing the way speakers communicate with their audiences. You may have first seen this type of interactive video wall during the election coverage and now it’s available for events! One company providing this service is PSAV, a leading audiovisual provider that has services all over the world, and even right here in San Francisco. 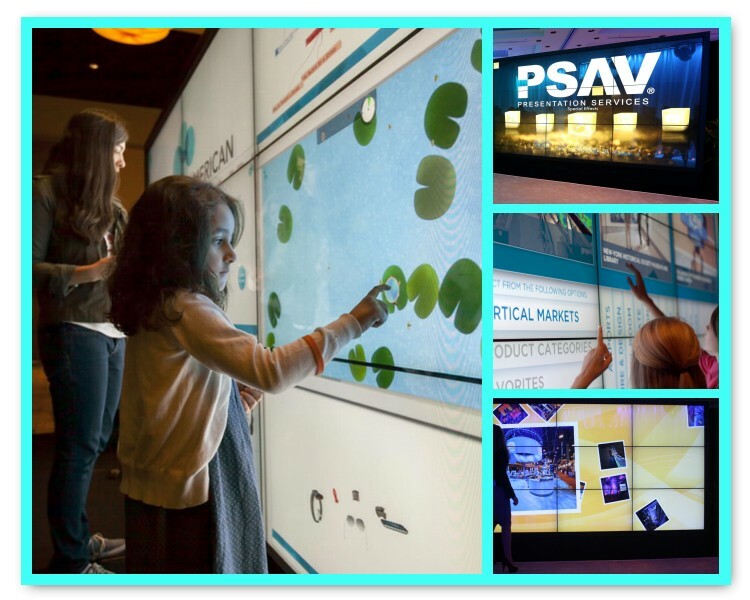 These interactive walls have 46-inch square screens configured in either a two-by-two or three-by-three format. If that is not sufficient enough, custom screens of any size can be created. The wall essentially operates like a large iPad with over two dozen apps that create maps, presentations, and games. An interactive wall can also be used for many purposes, being educational or for digital signage. If used for a trade show, the wall can display logos and information specific to a certain vendor. What we love most is that it enables planners to present their ideas in a digital way specific to their themes, while also providing sponsorship and advertising opportunities. To learn more about how this interactive wall works, check out the video below! Would you try an interactive wall at your next event? Let us know your thoughts in the comments below or on Facebook or Twitter! Startup Monday is ABCey’s weekly post that features some of the best and brightest companies in the Bay Area. They are often companies that we have our eye on or have worked with in the past & would like to share with friends and followers of ABCey Events. It seems like there just aren’t enough hours in the day to get everything done. We don’t know about you, but often times cleaning gets pushed to the bottom of our list. Exec can help solve that problem by allowing you to book home or office cleaning service instantly from your iPhone or web. Exec only uses the best supplies to keep your family and pets safe, and absolutely no chemicals are used. Their cleaners also have quite a few tricks up their sleeves – like using mineral oil instead of stainless steel polishing chemicals. It’s hard to find a good housekeeper, but their cleaners must pass rigorous cleaning exams, and they’re all fully vetted. They’ll send you a tag team of two to get your place twice as shiny! It’s a no-fuss solution to all your cleaning woes, with payments being made online! Not to mention, they‘ll come back and clean for free if you don’t love it. 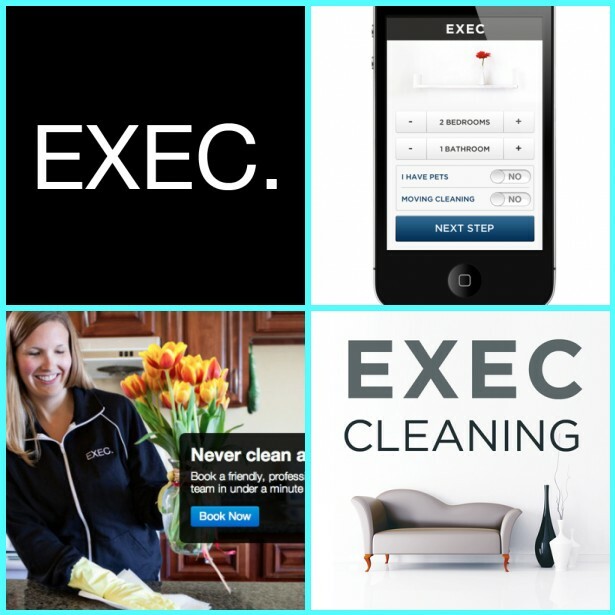 Exec Cleaning is fully bonded, licensed, and insured. They’ll even help you clean out your house when you’re moving! Exec was nominated as one of the fastest rising startups for the 2012 Crunchies Awards. They’ve also received attention from companies like Forbes, The New York Times, Inc. and The Huffington Post. Exec is now serving San Francisco, Seattle, San Diego, Los Angeles, New York, Boston, Chicago, and Washington DC with plans to expand to other cities in the U.S! Download their app and book a cleaning right from your phone, and see when the cleaners are on the way. We can’t wait to try Exec! It’s such a simple and accessible idea. Have you tried them? Let us know your thoughts in the comments below or on Facebook or Twitter! There’s a ton of fun events taking place all over San Francisco this weekend, as usual. We’ve got a holiday tradition at Yerba Buena, a fun athletic event benefiting the Make-A-Wish foundation, a couple of amazing music performances, and of course an awesome vendor fair. Not to mention, we have a special featured event by DISTRIKT that you just can’t miss! 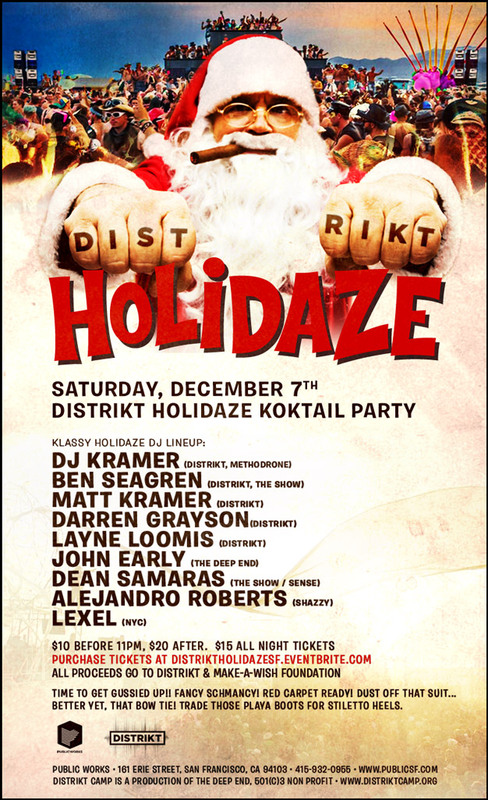 FEATURED EVENT: Distrikt Holidaze Koktail Party | Saturday, December 7 | 161 Erie St | Time to get all gussied up and fancy schmancy! This awesome event boasts a great list of DJ’s to perform including: DJ Kramer, Ben Seagren, Matt Kramer and many more! Better yet, all proceeds go to DISTRIKT and Make-A-Wish Foundation. Make sure to get tickets at a great price online, but don’t worry, because you can still get them at the door! Don’t miss out on this one of a kind holiday event! 1. The Velveteen Rabbit: 25th Anniversary | Friday, December 6 | 11am | Yerba Buena Center for the Arts | Head on down to the Yerba Buena Center for this beloved Bay Area holiday tradition. Told though music, dance and a powerful narrative, The Velveteen Rabbit celebrates the unique relationship between a little boy and his stuffed rabbit, and the enduring power of love. The classic festive costumes and madcap characters definitely bring the perfect amount of holiday cheer! 2. Brave the Bay 2013| Saturday, December 7 | 11am | San Francisco Aquatic Park | Attendees choose which athletic event most appeals to them – or they can participate in all of the activities in the “Santa Triathlon!” Come as a spectator (it’s free to watch) or join the fun to help raise money for Make-A-Wish. You’ll be helping grant wishes for children with life-threatening medical conditions. This active, festive holiday-themed event is perfect for San Franciscans of any age! 3. 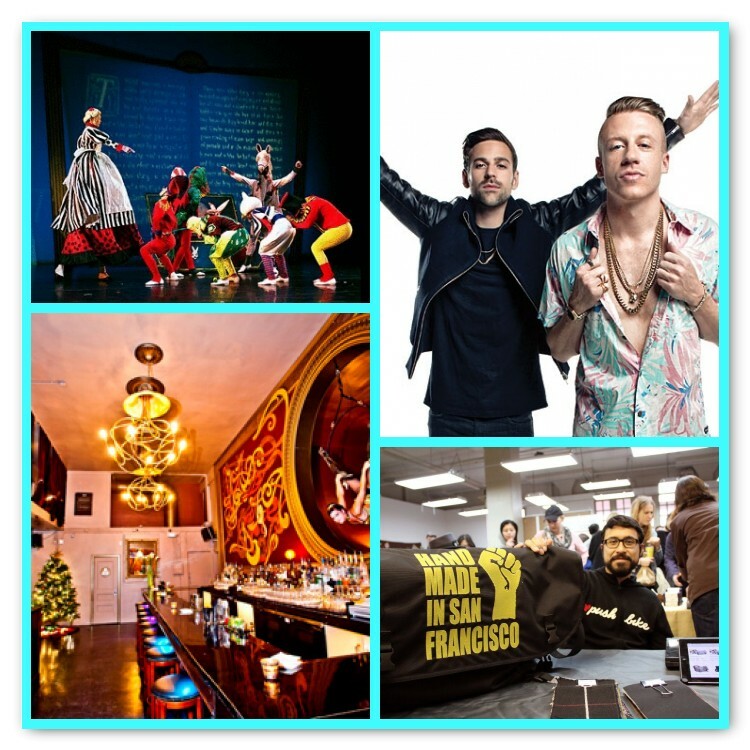 Macklemore & Ryan Lewis Tour | Saturday, December 7 | 8pm | Bill Graham Civic Center | Experience a totally different form of music and appreciate a genre beyond its limitation by getting tickets to this Macklemore and Ryan Lewis show. The duo linked up in order to create their unique debut EP titled VS. Witness the coming together of hot genres such as contemporary, and Hip-Hop while also experiencing other less familiar genres. It’s definitely a show you wouldn’t want to miss! 4. Lights Down Low | Saturday, December 7 | 10pm | Monarch | This weekend two popular acts, from slightly different spectrums of the musical scale, will come together for an amazing event. Deniz Kurtel, who is a huge fan of Burning Man and is often the featured centerpiece of Wolf + Lamb, is bringing her influences of deep house music. The other act, Pictureplane, will bring his music mixes that include dark synth, new wave, pop and progressive house music. It should be exciting to see how these two artists will work together this weekend. 5. SF Made | Sunday, December 8 | 10am – 5pm | Fort Mason Center | Check out San Francisco’s favorite local holiday fair. You can discover locally made gift items from 50 different vendors including: jewelry, apparel, gourmet gifts, chocolate and more! Also new this year, enjoy hot mulled wine from Sutton Cellars and yummy holiday knishes from King Knish. Let us know where you’ll be heading this weekend! Leave us a comment below, or on Facebook & Twitter! 1. Tablecloths | Start your party right, by creating a tablecloth that is sure to please! 2. 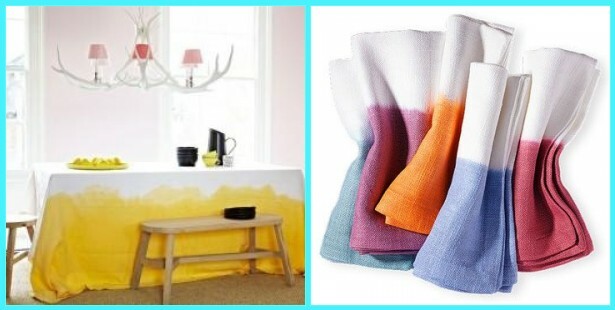 Napkins | Use plain napkins you have at home and spice them up with this ombre effect! 3. Napkin Rings | Add a pop of color to your table setting with cute napkin holders! 4. Place Cards | Lead guests to their seats by drawing them in with these fun place cards! 5. 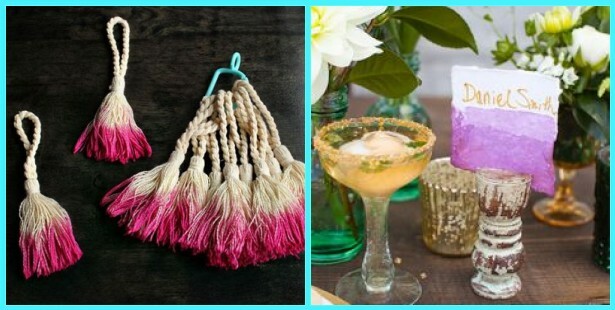 Tags | Giving a gift to your hostess? Make sure they know who it’s from with these cute tags that pop! 6. 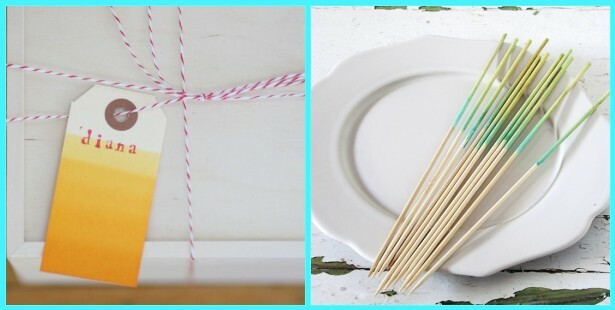 Skewers | Make your food eye catching by placing it on ombre skewers! 7. 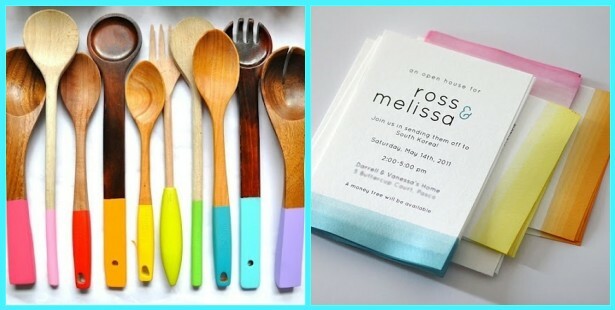 Utensils | Let guests serve themselves with brightly colored utensils! 8. Invitations | Get your guests excited for your party with this dip dye teaser! 9. Garlands | This super simple garland is made with simple coffee filters and looks so fabulous! Who would have thought?! 10. 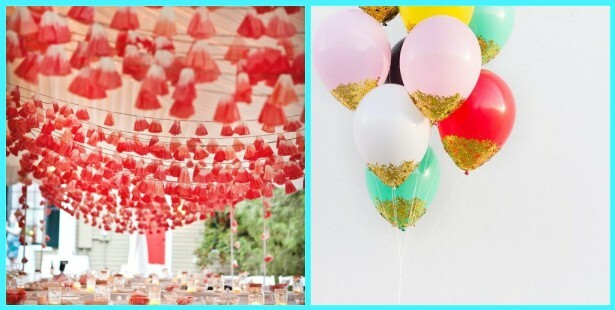 Balloons | Turn ordinary balloons into the coolest decor by dipping them in sequins! So glitzy! Which one is your favorite? What are you going to dip-dye next? Let us know in the comments below or on Facebook & Twitter! 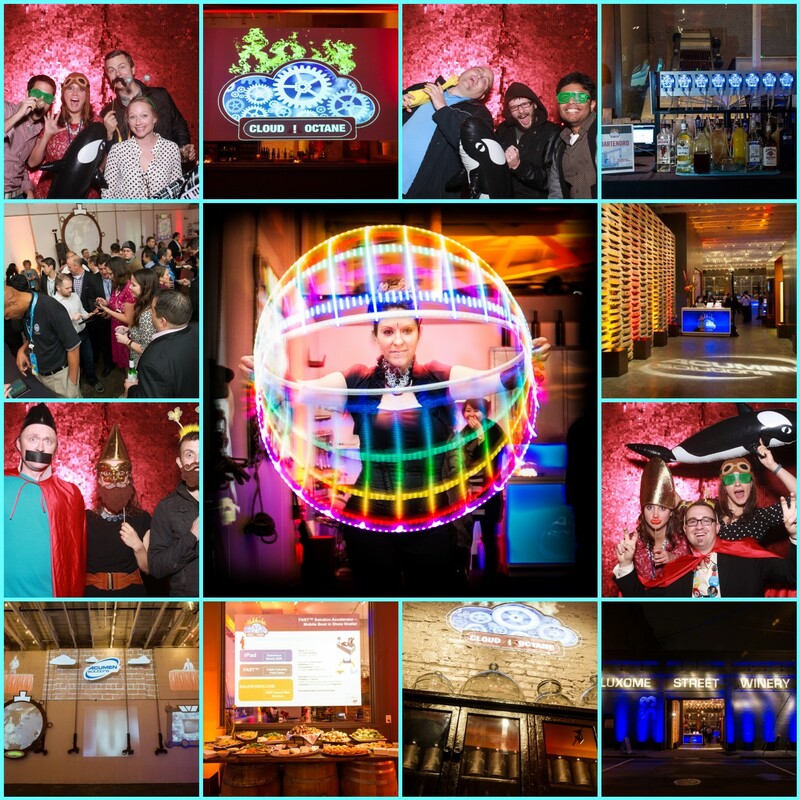 On Wednesday, November 20th ABCey Events produced CloudOctane 2013, which was hosted by Acumen Solutions in conjunction with Dreamforce at the Bluxome St. Winery, San Francisco! CloudOctane was designed to enable consumers to comprehend, engage in and discuss the evolution of Enterprise Cloud Transformation and the new Machine2Cloud technology. Event highlights featured a robotic bartender (Bartendro), an LED hula hoop performance by Lauren Shaw of SpinFX, 3D projection mapping mixed with live actors from Tekino Sf, DJ Mancub on the decks, Giggle and Riot Funbooths, eclectic appetizers from Greenleaf Platters, lovely floral arrangements from HUNTlittlefield, unique creative installations and more! And, a special thank you to Jim Vetter for all the great event photos! Heather Noll from Chalkboard Communications helped with PR efforts for the event and the SF Chronicle, The Wall Street Journal, PC World and Venture Beat all expressed interest. We even got a few shout-outs! Thanks everyone for helping to make it “the best party” of the night! ABCey was hired to manage all aspects of event planning and production including, AV, lighting, catering, decor, florals, entertainment, and photography. We couldn’t have be more thrilled to work with such a great team! For more photos, please check out the full online gallery ! What do you think of our event? Drop us a line below or find us on Facebook & Twitter! There’s so much social media activity at events now-a-days. Anywhere you look, someone is posting a picture on Instagram, commenting on Facebook, or retweeting something on Twitter with their smartphone. One major downside to this is how quickly battery life decreases. Unfortunately, it’s not really safe or practical to leave your phone charging by some random outlet. This is why we think Brightbox would be perfect to have at any event. 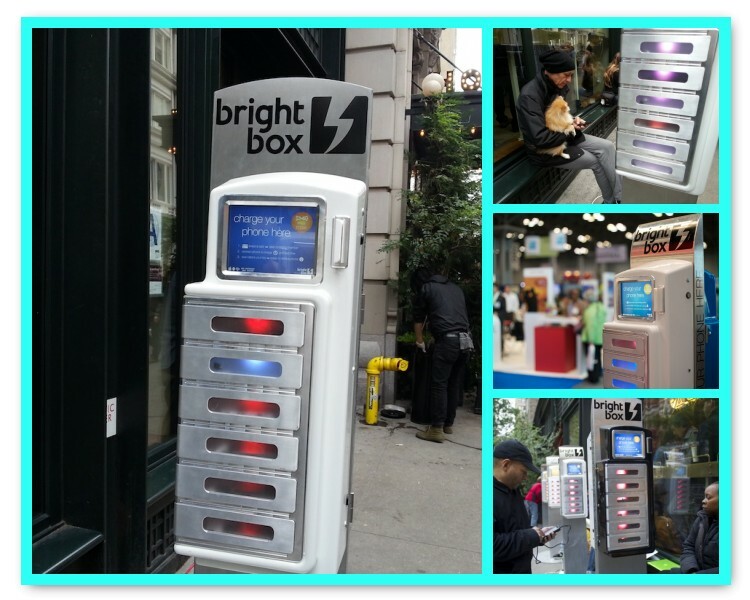 Brightbox helps eliminate the issue of having to wait by your phone at a charging station. It has 6 built-in secure charging stations so users can leave their phone for a few minutes, or even a few hours. All users have to do is unlock a compartment with the use of their credit card. If the event is sponsored by a vendor, charging is actually free for attendees. So, the credit card simply acts as a key. The great thing about Brightbox is that it charges a flat fee as long as the device is plugged in. We think this device would be a really great tool to have at any event. 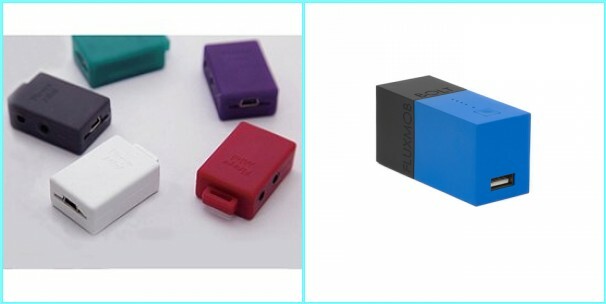 It lets users charge their phones without having to be restricted to one part of the venue. What do you think about Brightbox? Let us know in the comments below or on Facebook or Twitter! The life of an event planner can be really hectic at times. On top of all the meetings, to-do lists and site visits, we are often on the go. The only difficult thing about traveling, especially in San Francisco, is finding a great, affordable way to get to your destination. Thankfully Lyft is here to help! Lyft is quickly rising up to be a successful startup founded on a simple idea. Their goal is to set up everyday car owners with people who need rides. Lyft is great because it does not require users to flag down cars or call a taxi company. Instead, it simplifies everything through it’s mobile application where users can create an account and add their personal credit card information. They can then link to their Facebook or LinkedIn accounts. Once a ride is requested, it show users a picture of the driver, but also of the car that will be picking them up. Cars usually have a hot pink mustache attached to the front, so that they’ll be easy to spot! Once the car arrives, passengers are encouraged to sit in the passenger seat to help build a reputation with the driver. At the end of the ride, donations are suggested but not mandatory. There are a few other ride-sharing companies out there, such as Uber, however there are some major differences. Lyft is said to be more laid back with a fleet of compact cars, and drivers are even said to give their passengers a fist-bump when they first get in! Uber on the other hand is more reserved (passengers sit in the backseat). 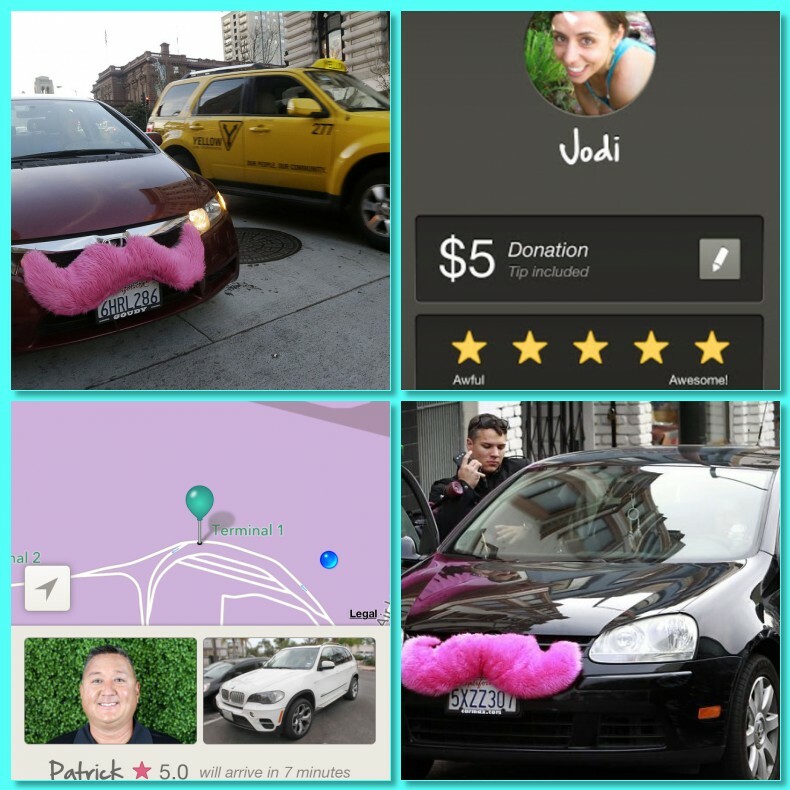 Lyft drivers can receive donations whereas Uber automatically adds a 20% tip. Next time we do a site visit, we will definitely give Lyft a try. It would also be great for our event attendees, since we all know how limited parking is in San Francisco. What do you think about this ride-sharing service? Let us know in the comments below or on Facebook or Twitter!